Military helicopters over Dulce, New Mexico – – – is it unusual or just normal? MILITARY HELICOPTERS OVER DULCE, NEW MEXICO – – filmed by Dulce resident Lorene Willis on June 15, 2017, outside her home facing the Archuleta Mesa. But, why?, some folks question. There are no known military bases anywhere near Dulce, New Mexico. 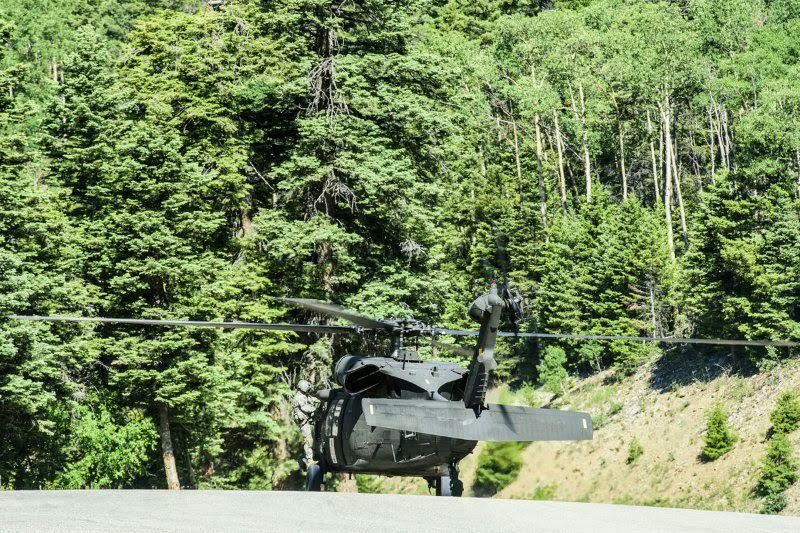 Some folks say the the most logical known base from where these helicopters originate may be Fort Carson in Colorado, more than 200 miles northeast. There seems to be none directly to the west, none to the north and none to the east, at least if we are talking about known military bases. However, there is a small facility in Durango, Colorado, 100 miles northwest. And there is a small National Guard facility in Rio Rancho, 158 miles southeast. Kirtland Air Force Base, however, in Albuquerque is about 177 miles southeast. But the big question is what are the military helicopters doing, specifically over Dulce, New Mexico? Flight training from far distance? Well, it’s possible, I suppose. There could always be prosaic answers to these things. As has been the case these past few months, discussions of Tom DeLonge, his TO THE STARS “Public Benefit Corporation,” and the supposed Pentagon UFO program, Advanced Aviation Threat Identification Program, have sucked all of the air out of other UFO-related discussions. As you have undoubtedly heard unless you have been hiding under a rock, TO THE STARS ACADEMY has released a third infrared UFO video, supposedly declassified by the recent Pentagon UFO Program. TO THE STARS claims to have a “chain of custody” for these videos, showing the process of their release by the Pentagon, but nobody has seen it. 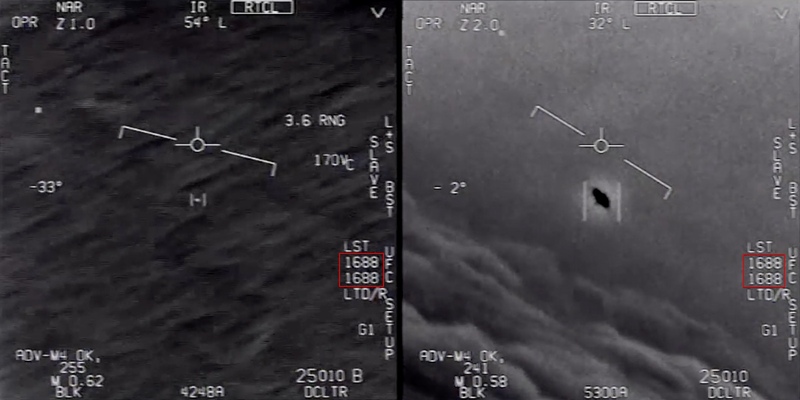 Also, why are all of the supposed Pentagon UFO videos in the infrared? Doesn’t the military have ordinary video cameras? Undoubtedly they do, but when birds or balloons turn up on ordinary video, they are immediately recognized. Is it perhaps because they have no real understanding of how these FLIR devices operate, and lots of things thus become UFOs? And only the Raytheon FLIR systems on the F-18 ever turn up UFOs – no other cameras, and on no other aircraft? “GO FAST” footage from Tom DeLonge’s TO THE STARS ACADEMY – – bird? – – balloon? West argues that the object’s apparent rapid motion is due to the parallax effect of the aircraft’s motion. There are several models of a 3-D representation showing the object and the jet, using the information provided in the FLIR display. The consensus seems to be that the object is about 10 feet across, and traveling slowly enough to be a bird or a balloon. If you look to the right side of the sensor overlays you’ll see a 4 digit code… That is the laser PRF code set for laser guided munitions…. Gimbal video is PRF code 1688. It took place in 2015 off the East Coast. Go Fast video is PRF code 1688. Articles sight [sic] it as taking place off the East Coast. Gimbal and Go Fast are both pieces of the same video it appears. No discrepancies in location or time as of now, however, this begs the question whether TTSA is cutting and feeding these videos to us to keep funds rolling in OR the gov is cutting/splicing and releasing them to TTSA intentionally this way. Others have remarked that the pilot’s voice on the two videos sounds like the same guy, especially when he says “dude!”. To summarize, there are no documents to support what Elizondo says about AATIP, and their absence is very curious. Do we have anything to document, other than Elizondo’s word, that this AATIP program even existed? Might AATIP have existed only as a “Rogue program,” never actually sanctioned? The U.S is ignoring UFO sightings, says former Pentagon insider – – but is his claim totally credible? The craft might not be alien, but could suggest that China, Russia or some other country has secretly developed incredibly advanced technology. A U.S. Navy F/A-18 Super Hornet encountered this apparent UFO off the East Coast of the United States in 2015. The following unilateral footage was captured by a Raytheon Advanced Targeting Forward-looking Infrared (ATFLIR) Pod, which contains the most advanced sensors and powerful tracking systems on the market. (Sensor is in infrared mode) – – sensor is aimed 35 degree left of aircraft axis, 4.1 NM slant from target to aircraft, sensor aimed 22 degrees below aircraft axis, F/A-18 is in a 5 degree right turn, ATFLIR target autotrack bars, F/A-18 calibrated airspeed (252 kts), mach number (0.61), F/A-18 altitude 25,000 ft.
“We have no idea what’s behind these weird incidents because we’re not investigating”, says Christopher Mellon, who served as deputy assistant secretary of defense for intelligence in the Clinton and George W. Bush administration. 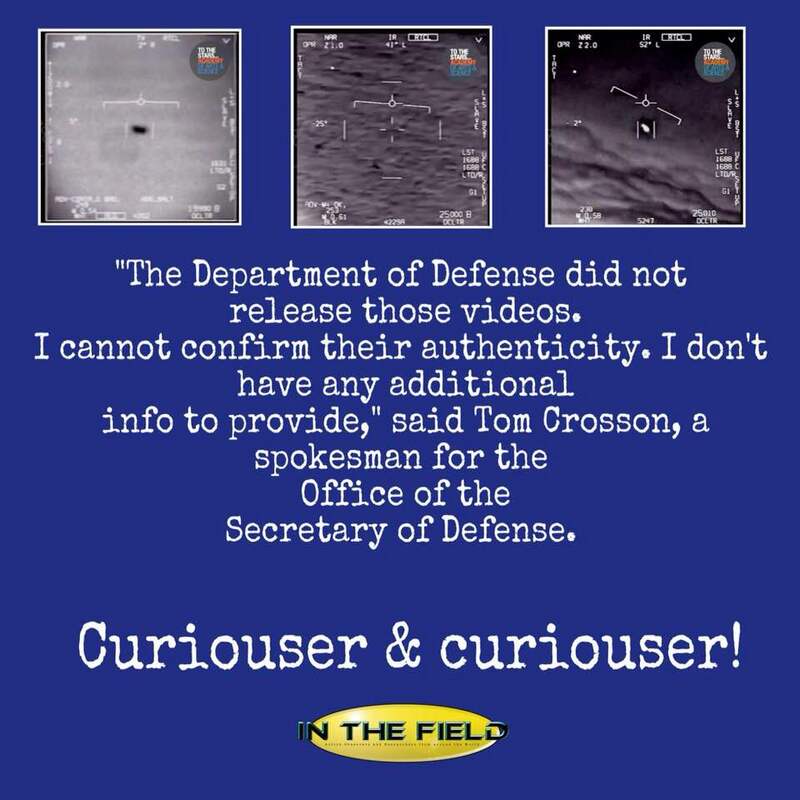 THE MILITARY KEEPS ENOUNTERING UFOs. WHY DOESN’T THE PENTAGON CARE?